The Regent collection of Traditional Bath and Basin taps is one of Victorian Plumbing's most popular traditional tap ranges. Inspired by Victorian and Edwardian traditional tap fittings, these Regent Traditional Bath Taps feature a shower mixer handset and are finished in luxury chrome. These traditional bath taps also work in a wide range of bathroom pressures, suitable for systems ranging from 0.5 Bar to 5.0 Bar. 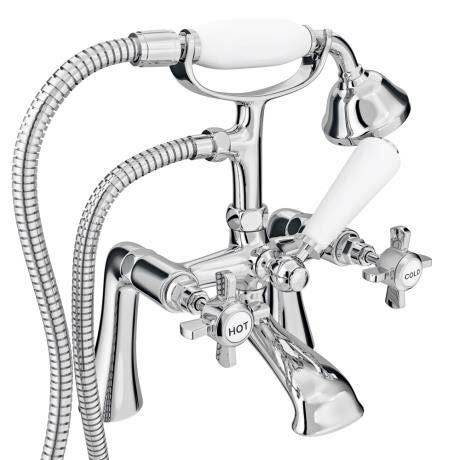 The Regent Traditional Tap collection has a screw down cartridge valve and comes with a 10 year guarantee for added peace of mind. Shower hose - 1.5m/150cm Approx. Q. Can these be wall mounted? Q. What is the thread dimension? Q. Is a shower head holder to fix on the wall supplied with the bath mixer , also are the taps on the mixer "single turn" ie do you have to turn them several times to shut off water or do they shut off in a single turn . Many thanks. The holder for the shower head is not fixed to the wall it is part of the bath mixer and the taps are not a single turn tap. 0 out of 2 found this question helpful. The white part of the bath shower mixer are ceramic made. 3 out of 4 found this question helpful. "Great product, that looks fantastic in our bathroom." Really elegant fitment. Purchased the basin taps to match as well. All wrapped so carefully so as to arrive to customer in perfect condition. Finger grip on the shower head bath tap is so good it does not slip when wet and soapy. Good idea!!! Excellent products - nothing negative to say. "Good quality product, packaged well for postal delivery with good instructions. I am very happy so far!" Perfect condition smart finish and very easy installation. The product is beautifully made and it looks chic in my new bathroom. Cool shower mixer to go with our bath. "A very good product, at a value price, and backed up with good seervice." This mixer tap system enhances the look of out old bath. I was very please with the speed and quality of service.